WHO WE ARE? WHAT WE WANT? For the moment we are 8 football fans from Cluj-Napoca, Romania. We found SUPPORTER 2.0 Football Club, a non-profit organisation, as an experimental project based on the supporters need to be involved in decision making at a football club, their fully transparency of a football club wish and because every football fan has an opinion and wants to be expressed. By offering this benefits, the project propose the union of all supporters forces, attracted by this project in order to develop SUPPORTER 2.0 Football Club. Be part of this project! If we will create a successful model for every club, maybe soon you’ll have the opportunity to be involved in the decision making and get also all this project benefits at your favorite club too! None of us is a football specialist, but we want to discover alongside you all the football secrets. In order to reach this goal we will need also the support of the specialized supporters. (players, coaches, sports directors etc.) We invite them to analyse the perspective of every involved supporters category and to contact us for every kind of collaboration. Also, none of us is a Pope and we will be transparent and present our interests from the beginning, subsidiary and dependent to the success of this project. Seven founders are also members in the clubs board led by Tecan Razvan, as President. In the organisation statute it’s mentioned that the clubs board can be paid with at most 5% from the supporters contributions and sponsorships incomes, excluding the possible revenues coming from the public institutions from Romania, just in case of reaching the organisation goal, to participate in an official senior football competition. The organization has signed a contract with RSM SOLUTIONS (REVOLUTIONARY SPORTS MANAGEMENT SOLUTIONS) private company, the developer of www.realclubmanager.com. For the IT services offered by this company, SUPPORTER 2.0 football club will pay 5% from the supporters and sponsorships incomes. In case of the success of this project and in case RSM SOLUTIONS company will sell the same services to other sports clubs, because SUPPORTER 2.0 football club it’s the first www.realclubmanager.com client, the company will pay to SUPPORTER 2.0 5% from their further incomes, for the promotional benefits. The administrator of RSM SOLUTIONS company is Tudor Racolta, the person who create the entire concept of this project. For the other expenditures, we are responsable to doesn’t have any connections with our personal interests, to make them transparent as much as possible and even ask your opinion about them, if will be possible. Being members of the Association gives us no financial benefits, because SUPPORTER 2.0 it’s a non-profit organisation. So we can not receive dividents, sell stocks, sell the club or get other benefits from this role. On the contrary, we assume the obligation of making a contribution of 400 lei/year. We see as an offense to ask conditions and obligations for the supporters which want to offer a financial support for the organization, without having any financial benefits. That’s why we want to attract supporters of this project, without any conditions and without assuming any further obligations to the Association. We have the obligation to offer you a great supporter experience and make you want to enjoy this as long as possible. Of course if we will be asked to change this, we will do it and will invite members to complete forms, to assume financials obligations, to respect the organization statute etc. or the Association will create a public limited company where the supporters will be able to buy stocks. We have a strategy in this sense, but the history has proven that the public limited company supporters projects and also those who promise the supporters the ownership of the football club fails. This can be used as a temporary cash injection for a football club, without any financial benefits for supporters at the end. The reason it’s very simple: The supporters needs football and should be attracted with football benefits, not making money from it. For making money, the investment in a football club it’s maybe the worst idea. Also it’s irrational to think that a football club which revenues are coming 100 % from their supporters (including sponsors, chairmans, football club owners and public institutions, because they are also supporters) will be able to pay more to all his supporters. It’s impossible because a football club it’s not a bank or an investment fund. A football club should pay the players, staff, management, services or make investments etc. in order to develop the club and to offer a great football experience to the supporters. So the football club development it’s depending on the board (management) and RSM SOLUTIONS (the use of www.realclubmanager.com) services. Everyone who can offer his services to the club will be paid if this collaboration will be in the club’s benefit. Of course if the project will have no success we will get no money and will lose the money and time invested in creating this project, starting from 2013. Else our services will be for the club’s benefit and we think that this is a fair partnership for every involved part. The board members is composed of 2 IT specialists, 1 sales Director, 1 industry Technical Director, 1 entrepreneur and 1 transport Operational Director. About me, Tudor Racolta and the club’s board President we can say that together we had success when we completely change an entire romanian niche market, few years ago. On a market with 20-30 total sales/year, we have made over 150 sales for the same services, in the first year. This way we determinate also the opponents to change their selling strategy and to increase their sales. Our strategy was based on customer needs orientation, combined with an efficient online marketing. We hope to make the same thing in football. The domain we are reffering to has no connection with football, but we see many similarities in their management. As we are, we will be your guarantee of implementing the procedures of this project, as it’s presented. Of course if the incomes of the club will permit us, we would like to let a football specialist who agrees this procedure to manage the sport activity of the club. We have tried to offer our services to other clubs. We understand that it’s very hard to change the procedure for dozens of people already involved in a club’s activity. That’s why we choose to found a new club, to attract the supporters who agree this opinion and in case of success to create a model for other clubs. 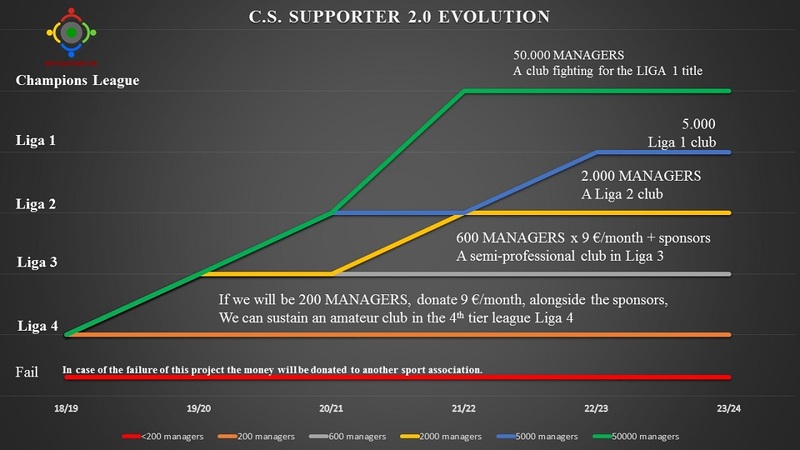 We propose a snowball effect based on meeting the supporters needs, increase their number, funding SUPPORTER 2.0, creating a good communication between supporters, board, staff and players, creating a good motivational environment for the players, SUPPORTER 2.0 development, promoting the daily sport activity among the population and creating a model for every club in the world. It’s welcomed every supporter without any restrictions! The club can be involved in the 4th tier league in Romania, which starts at the end of August. We have been informed that an amateur club budget in this league is about 70.000 – 80.000 lei. (80.000 RON = 17.163 € 02.07.2018) For the 3rd tier 100.000 € as a semi-professional team, for a 2nd tier club 300.000 € and for a First League club 1.000.000 € + the TV rights. Everything depends on us! The future of SUPPORTER 2.0 it’s in our hands! This moment the club has a capital of 3.200 lei, the founders initial contribution. We would like to invest all this money in online promotion, on facebook the most. This way we propose to attract as many MANAGERS as possible. Based on the promotion results, we would like to reinvest a part of all further supporters and sponsors revenues in promotion, at most 40% from them. Besides this strategy we plan to attract new MANAGERS from people we know. We invite you to make the same, because it’s the collective goal of this project to be as many as possible in order to develop SUPPORTER 2.0 football club! We are starting with the worst scenario: If the project won’t have success and the club won’t have 15.000 lei (3.218 €) (after spending on promotion <=40% of the incomes) in the bank account, until the start of the season, we think that will be inappropriate to join the 4th tier league. In this case we will vote what should be do next from: a) Joining a smaller league if it would be possible; b) waiting for the next season; c) will donate the remaining money to a similar Association. We hope that together will easily reach this goal! As soon we will reach this goal, we can start making anything is needed to start the sport activity in order to join the 2018/2019 romanian 4th tier league. (finding players, buying equipments, renting stadium etc.) Because we are starting from nothing and because of the short period of time until the start of the season, for sure we would not be able to poll every single decision, but we would like to poll the major ones, respecting the project procedures as described. We are unable to anticipate the results of the project. As soon we’ll get the first results we will plan and present a budget, sports objectives and maybe possible investments. The club’s expenditures and budget will respect the following principles: to assure the finances in advance for a long time, to create financial reserves if it’s possible, no loans (better we will stop the activity and in this situation everyone will be responsable for the low club’s revenues), long term investments in case of overfunding, in order to create a financially self sustainable football club. The first sport decision will be ours: The vote of the HEAD COACH. Cluj-Napoca has few football schools with remarkable Under 19 results in Romania. From all the players who obtain this results only few of them had continue football as professionals. Together with the HEAD COACH we will try to attract few of this players to play for us, based on the motivational environment offered by this project and the chance offered by this project for their careers. If we will not be able to attract this players we will invite amateurs, even mini-football players, or even from the MANAGERS. 1) To fund trainings organisation, motivate and attract the players by offering to the best of them sports contracts and to increase the objective prizes for players and coach. 2) To improve the training conditions. 3) To attract the best players from the 4th tier League or from the 3rd one. 4) To attract 2-3 experienced players, to create a good squad alongside them. 5) To get expensive players, based on our budget and respecting the financials principles of the club. Based on the project objectives, the union and cooperation between supporters in order to develop SUPPORTER 2.0, we would like to be a model of respect for us and for our opinions and also for the opponents and all other entities we will interact with. WE INVITE YOU TO CONTINUE THIS PAGE BY MAKING GOOD PROPOSALS IN THE www.realclubmanagers.com WEB APP! YOUR COLLEAGUES, THE OTHER MANAGERS ARE WAITING FOR YOU! AND THE BOARD IS WAITING TO APPLY YOUR BEST IDEAS AND WILL ACT AS YOUR EMPLOYEES!